Hercules® HD was developed in Australia for the new generation ‘High Density’ large square balers. Hercules® HD has been proven in the field as the twine of choice for contractors who depend on reliability and high knot strength. 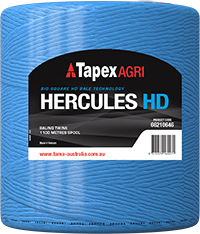 Hercules® HD is UV resistant twine, making it perfect for use even in the toughest Australian conditions. Tapex offer guaranteed minimum length in all of our twines. Don’t get caught out with short running spools. Strongest twine in the Tapex range. Developed for all High Density square balers. Maximum UV Stability for Australian conditions. * Based on 8’ x 4’ x 3’ bales size and 6 strings.